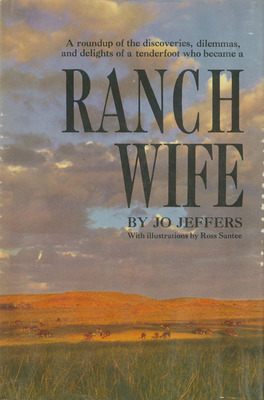 Jeffers, Jo , “Ranch Wife ,” Arizona 100: Essential Books for the Centennial, accessed April 21, 2019, http://speccoll.library.arizona.edu/online-exhibits-dynamic/az100/items/show/126. In her engaging memoir, she writes with clarity and insight of round ups and branding, cats and dogs, cattle and other critters, and, above all, of life and work adapted to the rhythms of the changing seasons and the demands of a beautiful but unforgiving landscape. With all its obvious charm (highlighted with drawings by cowboy artist Ross Santee), Ranch Wife pays honest and true tribute to the hardworking women of the modern West. --Bruce J. Dinges. New York : Doubleday, 1964.